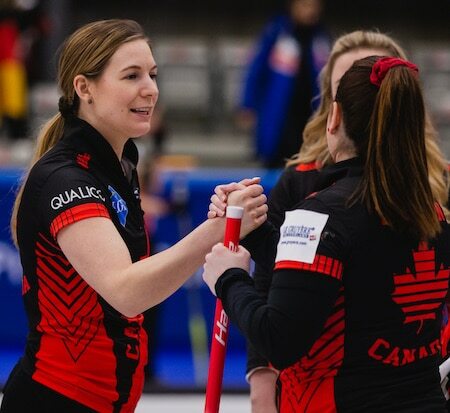 Yes, they are — with two round-robin games left to play on Friday, Team Canada still has a shot at a playoff position at the 2019 LGT World Women’s Curling Championship, presented by Pioneer Hi-Bred. That playoff position seemed to be out of reach in the early going of Thursday’s game against Russia’s Alina Kovaleva, after the Russians put a three on the scoreboard in the first end against a Canadian team that just a few hours earlier had gone down to a 9-3 defeat to Switzerland’s Silvana Tirinzoni. 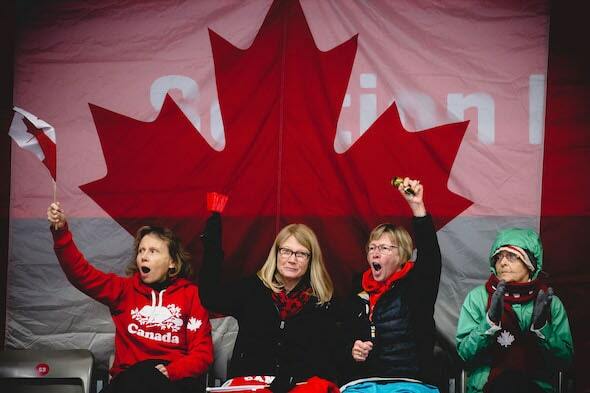 But Chelsea Carey’s Canadian team from Calgary — with vice-skip Sarah Wilkes, second Dana Ferguson, Brown, alternate Jill Officer, team coach Dan Carey and national coach Elaine Dagg-Jackson — buckled down and simply refused to quit. And just two and a half hours later, that early 3-0 deficit had turned into a 9-6 victory, improving Canada’s record to 5-5 — not in a playoff position, but not officially out of one, either. That was evident against the Russians, who dipped to 7-3 with the loss. After giving up the three in the first end, the teams then traded deuces in the second and third ends. But Canada would tie it with a Carey tap for three in the fourth. And from then on, Canada was in control. Canada would steal one in the seventh and then force Russia to a single in the eighth. And then in the ninth, with Russia applying significant pressure, two wonderful shots from Wilkes essentially won the game for Canada — the first a runback triple takeout and the second a wonderful draw behind a corner guard. That set the table for Carey to finish off the end with a draw for three. Six teams will make the playoffs when round-robin play wraps up Friday evening; Canada currently sits tied for seventh with Jamie Sinclair of the U.S. But those 5-5 teams are just one position back of Seina Nakajima’s Japanese team (5-4), which plays three teams above it in the standings to close out the round robin. Not that Canada’s path is easy on Friday — a game with reigning Olympic champ and playoff-bound Anna Hasselborg of Sweden (8-1) at 4 a.m. (all times Eastern) and against the host Danes skipped by Madeleine Dupont (2-8) at 2 p.m., with a full house of Danish fans likely in attendance.